Lamborghini's Urus goes on sale in 2018. It has a V-8 twin turbo engine. 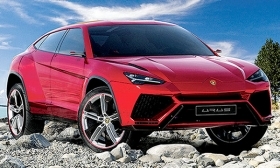 SANT'AGATA BOLOGNESE, Italy — The new V-8 twin turbo engine in Lamborghini's Urus SUV will make 650 hp, CEO Stefano Domenicali said in an interview. Lamborghini plans to build 1,000 units of the large SUV next year and 3,500 annually starting in 2019, though production could grow if demand is higher, the CEO said. Lamborghini last year built about 3,500 two-seat sports cars. The large SUV will be unveiled by the end of this year at the company's factory here. It will be built alongside the Huracan and Aventador sports cars. For the Urus, Lamborghini will add a paint shop, the first in its 54-year history. The company has previously relied on external suppliers. The Urus will go on sale in Europe in the second quarter of 2018 priced slightly below 200,000 euros. U.S. sales will follow in the third quarter and possibly will start below $200,000 before a gas guzzler tax. Lamborghini sold a record 3,457 vehicles worldwide last year, up from 3,245 the year before. The U.S. was its biggest market with 1,041 cars sold, ahead of Japan with 359 and the UK with 326, according to company data. Currently Lamborghini has waiting lists from six to eight months for its V-10 Huracan, which in Europe starts at 210,000 euros, and about one year for the V-12 powered Aventador, whose list price starts at 350,000 euros. Customers normally add another 50,000 to 80,000 euros in personalization on the larger Aventador and 30,000 euros to 50,000 euros on the smaller Huracan. Lamborghini is owned by Volkswagen Group through its Audi unit. Domenicali, a former Ferrari Formula One team boss, joined Lamborghini as CEO in March 2016.